The season of goodwill is also the time of year for feasting, with The SoGlos Christmas Cookbook, sponsored by Tivoli Wines, full of delicious recipes and wine suggestions that will impress friends and family throughout December. Get set for the festive season with The SoGlos Christmas Cookbook. Christmas time is the perfect excuse to indulge in some delicious food and drink, with The SoGlos Christmas Cookbook, sponsored by Tivoli Wines, featuring tempting seasonal recipes to help you in the kitchen. You’ll also no doubt want to enjoy some tipples come Christmas Day, with Tivoli Wines suggesting the perfect wine pairings to accompany each course of your festive feast. 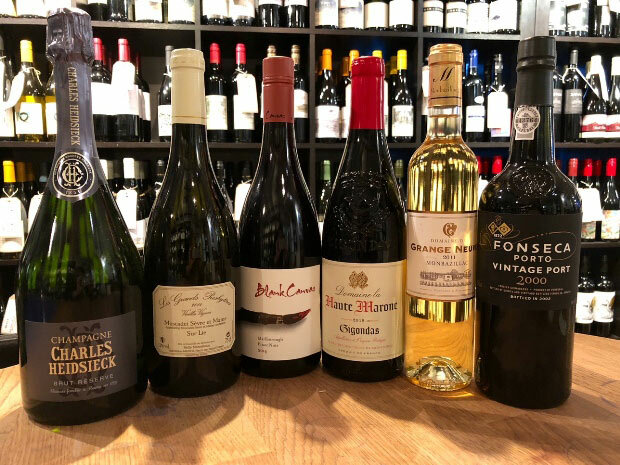 For expert wine advice for the festive season and beyond, pop into the independent Cheltenham wine emporium where the knowledgeable team are on hand to give tailored suggestions, while you can also sample 32 wines by the glass in its newly launched Wine Library. For more information, call (01242) 269886, or visit tivoliwines.co.uk directly. Smoked salmon and seafood are often picked as Christmas Day starters and are a great way of learning about food and wine matching. Smoked salmon is rich and slightly fatty so the perfect wine pairing needs acidity and enough complexity to ensure that it doesn’t fade into the background. Add the richness of shellfish, such as lobster or prawns, and it’s got to be Champagne, and there are few better non-vintage options than Charles Heidsieck, which is currently on offer at £38. If you’ve already made it past the Champagne, we would recommend a crisp white from the Loire Valley in France, like our old vine Muscadet or any Sancerre. If we were just talking about a Sunday roast turkey or chicken, we’d just grab a bottle of oaked chardonnay and get on with it. But Christmas dinner, with its varying sides and sauces, make this much trickier. Our tip is to follow the gravy… a really good white Burgundy or Californian chardonnay would work best with lighter sauces, but porky sausages, stuffing and darker sauces all lead towards red wine. At the heavier end of the scale, try our Haute Marone Gigondas or any Cairanne for a great value alternative to Châteauneuf-du-Pape, or if you prefer perfume and elegance, just buy the best Pinot Noir you can afford. A French Pinot Noir will tend to give you more savoury complexity, whereas countries like the USA or New Zealand will provide more fruit. We get asked just as much about beef for Christmas Day as we do turkey. Clearly it needs to be red, as white wine tends to get a little lost. The heavier reds of Châteauneuf-du-Pape would work well but you could also go for a good left bank Bordeaux such as a Margaux or Pauillac, which blends Cabernet Sauvignon with a little Merlot (amongst others). For a more intense fruit hit, look for the same grapes from Australia, South Africa or USA. Our pick would be Glenelly’s Red Estate blend from Stellenbosch in South Africa. Everyone automatically associates red wine with cheese. We won’t usually argue with the idea that you should just drink the wine you like with the food you like, but generally these two just don’t work together. Keep back some full-bodied white, switch to port, preferably Tawny, which has a slightly less overwhelming dark fruitiness than vintage port, or go for a sweet white, like Sauternes from Bordeaux in France. The contrast of a sweet Sauternes with a salty Stilton is simply awesome! The golden rule is simple, make sure the wine is sweeter than the dessert. Don’t forget that you’re at the end of a heavy meal and more wine might be the last thing you want. You can always move onto the spirits afterwards but if you insist, go with the flavours. Lighter trifles need lighter dessert wines, again something like Sauternes or its French neighbours Monbazillac and Barsac. Christmas pudding is full of dark, dried fruit, so follow its lead with the date and prune flavoured Pedro Ximénez Sherry. 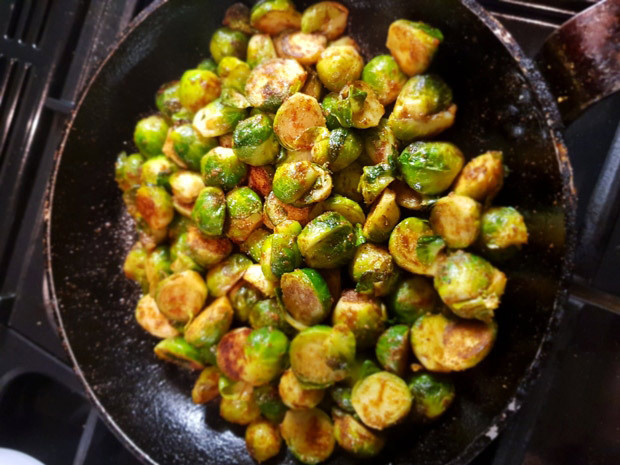 Ross & Ross Food’s Brussel Sprout dust has been created to transform the humble vegetable into an irresistible side dishes that no one will complain about come Christmas Day! Ginger, garlic, chilli, cumin, coriander, cardamon and paprika have been combined together to create a delicious Indian flavoured dust to cook with the sprouts. Trust us, your guests will be coming back for more. The Sprout Dust is available from rossandrossfood.co.uk. 1. Trim Brussels sprouts, parboil in salted water for around five minutes. 2. Drain and cut in half lengthways. 3. Heat pan on stove with a dash of oil, add the sprouts, butter and dust. 4. Toss, then dust again and cook for around five minutes before serving. There’s nothing like a roast ham to treat guests to on Boxing Day, with Ross & Ross Food’s Roast Ham Glaze adding an extra special twist on the classic seasonal favourite. The glazes uses Habanero chillies, which have a deep, hot chilli taste, that’s balanced out with the sweetness of pineapple and peppers to create a delicious sticky coating for meat that’s brimming with flavour. The Roast Ham Glaze is available from rossandrossfood.co.uk. 1. Soak the ham for 12 to 24 hours in cold water. Change the water every four hours or so. 2. Bring a large pan of water to the boil and add the ham and remaining ingredients. 3. Boil for 20 mins per 500g, skimming any impurities as you go. Remove from the water and peel of the skin. Leave some fat on and then leave to rest. 4. Heat oven to 200°C. 5. Score the fat with crosses and stud with cloves. Cover with some of the glaze. 6. Place the ham in a roasting tray with a little bit of water in the bottom of the tray. 7. Roast for 30 minutes. Basting and applying more glaze every 10 minutes ensuring it doesn’t burn. 8. Rest for 30 minutes. Serve straight away or allow to cool. Julian Effenberger, head chef at Cheltenham eatery, The Find, shares his favourite festive recipe that makes a great alternative to turkey or is perfect for a Christmas Eve or Boxing Day feast. The pork belly is slowly braised and then pan-fried to get a thin and crispy crackling, which when teamed with his partner’s orange and date stuffing, is transformed into a real show stopper that will definitely impress guests. 1. Preheat your oven gas mark 8, fan 200°C. 2. In a deep oven dish place all of the ingredients for the mulled cider and the flat belly, skin side up. Cover with tin foil and put in the oven at gas mark 8, fan 200°C for 10min, then turn down the oven to gas mark 3, fan 150°C and cook for a further two hours. 3. Once the pork is cooked, drain the liquid through a sieve in a saucepan; this will be used to make your gravy once thickened, either with corn flour or with your favourite gravy powder. 4. Leaving the pork in the dish, place a sheet of baking parchment on top of the pork and place another empty dish on top of it and press, this will allow the skin to flatten and the pork to have a more regular shape. 5. Meanwhile, make the stuffing by placing all of the ingredients in a bowl and mix well. Shape the stuffing into little balls, say the size of a large marble, pan fry with butter on medium heat for 10min, until brown all over. 6. Now portion your pork by slicing it width ways into the desired number of portions. In a heated oiled pan on medium heat, carefully place the pork skin down and immediately cover with a lid as the fat will splatter! Leave for seven minutes until the skin becomes crispy. 7. Serve with garlic and rosemary roast potatoes, buttered carrots, honey and mustard parsnips and wilted baby green cabbage. Hobbs House Bakery's Tom Herbert, one half of The Fabulous Baker Brothers, was inspired by his wife’s aunt’s recipe to create these delicious mince pies, which feature orange-infused short crust pastry and a fluffy cream cheese and almond topping. The recipe, which serves 12, is perfect for whipping up before inviting friends over for mulled wines and festive nibbles, or to enjoy by the fireside on the chilly days between Christmas and New Year. 1. Preheat the oven to 220°C/450°F/Gas 8. 2. Take a 12-hole deep muffin tin – if you have an old tin then lightly grease it, however if you’re using a non-stick tin you don’t need too. 3. Roll the pastry to 3mm thick then zest one of the oranges over half the pastry. Fold the other half of the pastry over the top then press down lightly. 4. Roll the pastry to 3mm thick then stamp out rounds 2cm larger than the holes of the bun tin. Press each disc gently into the bun tin, making sure that it doesn’t tear. 5. Mix the mincemeat with 25g of the flaked almonds, then add the cranberries, chopped ginger, spices and zest of the second orange, then mix once more until really well mixed. 6. 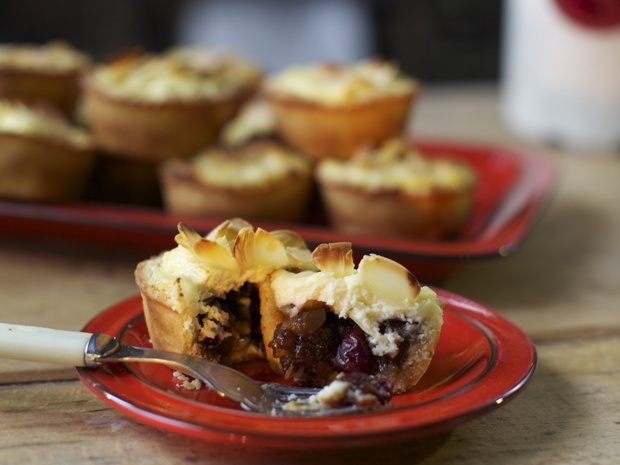 Place spoonfuls of mincemeat into each pastry disc, filling to about two thirds full. 7. Whisk the cream cheese, 3 tbsp of orange juice and the icing sugar together until smooth and creamy. Taste to check for sweetness, adding more orange juice and sugar if necessary. 8. Place a spoonful of the cream cheese mix on top of the mincemeat then scatter over the flaked almonds. 9. Place in the oven and bake for 12-14 minutes until golden brown and bubbling. 10. Leave to cool slightly before removing from the tin – best served warm. Tip – if you’re cooking these and then having some the next day, they’re best placed back in a hot oven for a few minutes to crisp back up. If you want to skip dessert or just fancy serving your guests a little something sweet with their after-dinner coffee, then there’s nothing like homemade truffles to hit the spot. This recipe from Harts Barn Cookery School offers a boozy twist on classic dark chocolate truffles and is perfect if you know that you’re going to be hosting fans of gin! 1. Place glass bowl over a saucepan of water making sure the bowl is not touching the water. 2. Place the chocolate and cream in the bowl and whisk together. 3. Heat the water to simmering point and allow the chocolate mix to melt. 4. Add the gin, tonic, lime juice, zest and butter to the mix and whisk. Chill in the fridge for up to three hours. 5. Roll the mix into truffle size balls and place onto a tray lined with baking parchment. 6. Place tray in the freezer for 30 minutes. 7. Melt some white chocolate. 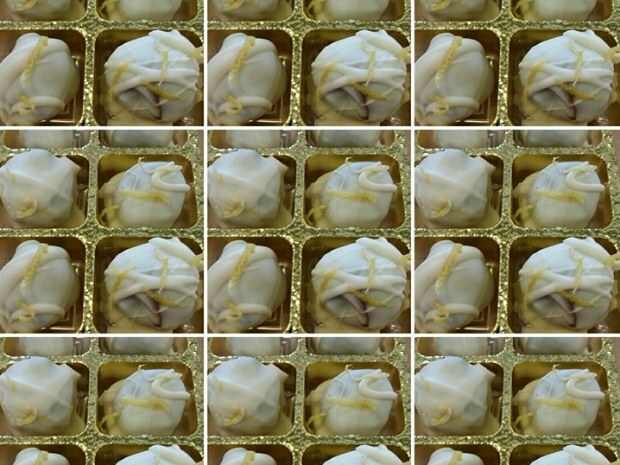 Place each truffle into the white chocolate and then place back on the tray. 8. Sprinkle some of the lime zest over the white chocolate and let set.